So I ran out to grab one at my local vinyl shop and all that was handed to me was a Pyle unit. I wasn't thrilled, but it got the job done (for now). Looking for better options please. I’m on the same quest as you my man! My Rotel pre has phono inputs but the VTL on the big rig does not. Been thinking about the Vincent PHO 700 tube pre. I believe there are quite a few Polkies that are running the Vincent. Yeah!!! That's all he had, I asked. Granted, he specializes in vintage equipment which typically come with them built in. The Schiit Mani is a solid option and it is very reasonably priced with a lot of great reviews behind it. Very flexible too as it can accommodate a wide variety of Mm and MC carts. Take a look in the closeout section of their website. They have quite a few mani's there. A goodly amount of people speak well of the ArtDJ Pre II also. Don't be afraid to look at Chinesium too. I use a Little Bear T10 that is quite nice. How would that Schiit compare to the Parasound Zphono? Parasound recently released the Zphono XRM that looks very interesting. I've got a ps audio Phono if you're interested. Looks to be a nice unit. For less than $100, the ART DJPre-II is hard to beat. That's my "backup" phono pre. It's nice but it only handles MM carts. I had a zphono a few years ago, nice piece of gear. I think that the Mani is far more flexible in matching the carts. Arty, since I was a help in getting that table running, I might as well throw this into the mix for you, I have a Cambridge Audio Solo I am about to sell because I upgraded. Bought it brand new about 3-4 months ago. Sell to you only for $100 shipped. Have box and all that came with it. Basically mint. Used Jolida JD9 like this one on ebay, maybe? Can be modded easily and inexpensively to sound very good (pairs of caps, opamps, & tubes - see mod threads here, AK, & SH). The low height full width form factor is a plus in my den rig since I don't have room for multiple little boxes (and cables) to sit around. If multiple little boxes is not a factor, you might want to look at new Lounge/Coupla combo - excellent value, sounds very good with my limited range of MM, HoMC, and LoMC, and offers mix-and-match flexibility for future gear changes. I will second the Jolida JD9. Nowhere near <$100 but a fine pre and it responds very well to tube rolling. There is a MKII for $50 more, FYI. Interesting little guy. Lot's of good reviews out there. 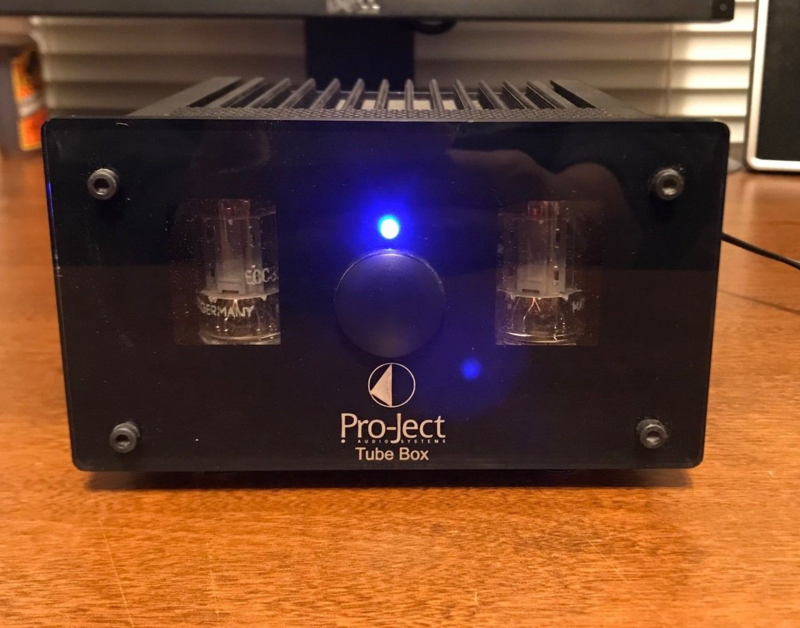 Pro-Ject Tube Box. For your consideration, I've enjoyed the MoFi StudioPhono, with adjustable gain, impedance, and a mono setting. I wanted the additional gain settings for a low output MM cart. Now, I'm glad I got it because it also opens up the possibility of getting an MC cart. Sorry, missed the $100 range. With a 15-day return, I would check out the $129 Schiit Mani. I think all the Schiit gear I've had has been good value. A used zphono is respectable in that price range. B-stock is $99! 25 units available as of today. After @joecoulson graciously offered me the Cambridge, I went and looked up the specs for my cart thinking I had a LO unit (turns out it puts out a respectable 4.0mV) and came to the conclusion that, although it's miles above the ion POS TTi was running, it's still a bottom of the barrel unit. So now the request is for a combo that plays nice with each other. Ideally the pre will have adjustable gain, be capable of both MM and MC (will stick with MM for now), and NO TUBES. I can't afford it already, and tubes will not help the situation. The rig will consist of 2.3s driven by either my 2400PE, or GFA 545, and a NAD integrated (c320 bee), or NAD 1700 pre (MM only phono stage). Let's try to keep it under $500 total for both pieces. Keep in mind that currently it's a Sumiko oyster cart mated to a Pyle pre, so it can't get worse than that. I have the Vincent PHO-8. It is a decent $300.00 unit. The sub 500.00 field is pretty crowrded, lots to chose from. The Vincent is on the warm side, which appeals to my taste. There are an online retailer or two, that give a 30 day trial. Oh, it can always be worse So you said earlier that the Sumiko Oyster is too laid back for you. I tried a Sumiko Pearl and felt the same. Do you have a preference of bright vs warm vs analytical? Some brands have a house sound that we might be able to steer you towards. I have that same phono preamp myself, although it has become my [cough] very nice backup for the time being. Don't let its diminutive size fool you. If they won't ship, Send me the money through PP, I 'll meet the guy in Havertown and ship it to you. Given that my current rig is already a bit warm and easy, I think a more analytical or slightly bright cart might help to balance it out. I know my speakers are capable of far more than the cart I'm running, so the search for a better match is on. were I you, I'd be careful of bright or analytical cartridges. Again, just the way my ears are; YEMV.